If Your Display Looks Like This… use an External Monitor and call us! So you open your awesome MacBook one day to find your screen looking like the image below, we imagine that you are not too excited about it. If you ARE excited about the change and would rather re-purpose your technology for artwork, just buy a mounting bracket and hang your MacBook on the wall! Who else in your circle of friends has such a beautiful piece of art? It even boasts a back-light for vibrant viewing at night. Right? Okay, maybe not. Although this image is rich with beautiful hues of green and yellow, you would probably rather see your normal desktop with its familiar icons. The good new is that until you have it fixed, you can use an external monitor to resume your digital life. MacBook Display with Damaged LCD Panel. You can use an external monitor to bypass this screen. Oftentimes when a display is damaged you will still be able to see and use part of the screen. But in some cases, the screen is damaged in a way where it becomes completely unusable. In cases like the one above with the pretty green hue, the issue is just the LCD panel. Replacing the LCD panel will get the computer running properly again. Sometimes you may need to use your computer while the display is not working. Read on to find steps for connecting your MacBook to an external display. The first step is to gather a couple of items you will need to connect your MacBook Air to the secondary display. You will need a secondary display with VGA, DVI, or HDMI inputs. If you have a even slightly modern TV, it will likely have HDMI inputs. An adapter to go from your mini display port to the port on your monitor. If you are going to use your TV with an HDMI port, here is an example of an adapter that would work with a MacBook Air. A cable to connect to your adapter then to your monitor. If you are using your TV, you could disconnect something that is plugged in currently using HDMI (like a blu-ray player), and connect your MacBook Air. Once it is connected, you will see a secondary screen on your monitor where you can work. You may want to go a step further and have the secondary display be your primary display. If so, just connect a keyboard and mouse to your computer. After you have made the connections and are sure you are connected to power, close the MacBook lid. This will force your machine to use the external monitor as the primary display. Using a secondary monitor is a great workaround for an emergency. Once you want your portable MacBook Air to be up and running again without having to connect to an external monitor. We can help! 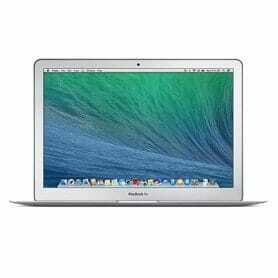 We offer the MacBook Air LCD replacement you would need to get your computer back up and running properly. The Touch Bar on the new MacBook Pros is gorgeous. At MacScreenRepair.com, we love MacBooks. They’re pretty…and pretty awesome. BUT they come with a significant price tag. Apple is confident in their prices because they’re confident in their product. If you are a MacBook Pro owner, we realize that you have made a substantial investment in your MacBook. Therefore, we do what we do to ensure that you have maximum life out of your technology. A few weeks ago, the folks at MacRumors.com updated a post they had written about recent updates to our beloved MacBook Pro. They discussed new processors and GPUs that Apple dropped into their MacBooks back in June of 2018. The updated article can be found here. Although faster processors are always a welcome modification, we still can’t get over the touch bar. It looks amazing and adds useful functionality. Whenever you have a union between sleek aesthetics and increased functionality – we feel that it’s a union to be celebrated. Here is a video from Apple’s YouTube channel which shows the new MacBook Pro. This brief list barely scratches the surface of what’s in the article. If you have a MacBook Pro with a touch bar, head over to the article and give it a read. After all, technology is only as useful as it’s user allows it to be. Are you in Need of Screen Repair Services? 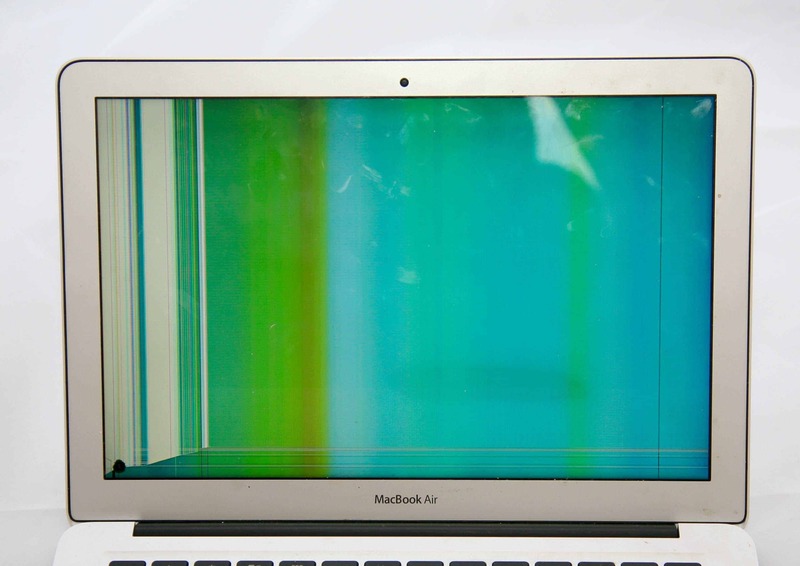 Do you have a cracked screen on your MacBook? Do you have a damaged LCD panel? We can help! Allow us to give you a free quote. Experience our quality service with an industry-leading 24hr turnaround of most repairs. Contact us today! This MacBook Air experienced a small impact on the bottom left of the screen. Although this blue and green hue is quite gorgeous, it would have a better place as a desktop background rather than your primary display. We replaced this client’s LCD screen to restore full functionality. This 13 inch MacBook Air is displaying a green and blue hue as a result of LCD panel damage. Oftentimes when a display is damaged you will still be able to see and use part of the screen. But in some cases, the screen is damaged in a way where it becomes completely unusable. In cases like the one above with the pretty green hue, the issue is just the LCD panel and a replacement will get the computer running properly again. If you need to use your computer while the display is not working, there is a method to using a secondary display that works quite well. Once it is connected, you will see a secondary screen on your monitor where you can work. If you want to go a step further and have the secondary display be your primary display, just connect a keyboard and mouse to your computer, be sure it is connected to power, then close the lid of the machine. This will force it to use the external monitor as your main monitor. While using a secondary monitor is a great workaround for an emergency, chances are you want your portable MacBook Air to be up and running again without having to connect to an external monitor. We can help! We offer the MacBook Air LCD replacement you would need to get your computer back up and running properly.